The Apostles' Creed (Latin: Symbolum Apostolorum) is an early statement of Christian belief, that is widely accepted in western Christianity. It is used by a number of Christian denominations for both liturgical and catechetical purposes, especially during the rite of Baptism. Specific groups using the creed include the Latin Rite of the Roman Catholic Church, Lutheranism, the Anglican Communion, and Western Orthodoxy. It is also used by evangelical Protestant denominations such as Presbyterians, Methodists, Congregationalists and many Baptists. The Apostles' Creed was esteemed as an example of the apostles' teachings. Its name comes from its twelve articles, which are believed to have been written by the Twelve Apostles, each of whom allegedly contributed one article under the inspiration of the Holy Spirit after Pentecost. The theological specifics of this creed appear to have been originally formulated as a refutation of Gnosticism, an early heresy. The creed states that Christ suffered and died on the cross, which contradicts Gnostic claims that Christ did not really suffer and die but only appeared as if he did. Because of its early origin, the creed does not address some Christological issues defined in the later Nicene and other Christian Creeds. This makes it acceptable to many Arians and Unitarians. Many hypotheses exist concerning the date, nature, and origin of the Apostles' Creed. It was apparently developed from what scholars have identified as "the Old Roman Symbol" of the first or second century and influenced later by the Nicene Creed (325/381). However, some historians place its origin as late as fifth century Gaul. "If you credit not the teachings of the priests… let credit at least be given to the Symbol of the Apostles which the Roman Church always preserves and maintains inviolate." The earliest appearance of the present Latin text was in the De singulis libris canonicis scarapsus ("Concerning the Single Canonical Book Scarapsus") of St. Priminius (Jacques Paul Migne, Patrologia Latina 89, 1029 ff. ), written between 710-724 C.E. Credo in Deum Patrem omnipotentem, Creatorem caeli et terrae. Et in Iesum Christum, Filium Eius unicum, Dominum nostrum, qui conceptus est de Spiritu Sancto, natus ex Maria Virgine, passus sub Pontio Pilato, crucifixus, mortuus, et sepultus, descendit ad ínferos, tertia die resurrexit a mortuis, ascendit ad caelos, sedet ad dexteram Dei Patris omnipotentis, inde venturus est iudicare vivos et mortuos. Credo in Spiritum Sanctum, sanctam Ecclesiam catholicam, sanctorum communionem, remissionem peccatorum, carnis resurrectionem, vitam aeternam. Amen. Πιστεύω εἰς θεòν πατέρα παντοκράτορα, ποιητὴν οὐρανοῦ καὶ γῆς. Καὶ εἰς Ἰησοῦν Χριστòν, υἱὸν αὐτοῦ τòν μονογενῆ, τòν κύριον ἡμῶν, τòν συλληφθέντα ἐκ πνεύματος ἁγίου, γεννηθέντα ἐκ Μαρίας τῆς παρθένου, παθόντα ὑπὸ Ποντίου Πιλάτου, σταυρωθέντα, θανόντα, καὶ ταφέντα, κατελθόντα εἰς τὰ κατώτατα, τῇ τρίτῃ ἡμέρᾳ ἀναστάντα ἀπò τῶν νεκρῶν, ἀνελθόντα εἰς τοὺς οὐρανούς, καθεζόμενον ἐν δεξιᾷ θεοῦ πατρὸς παντοδυνάμου, ἐκεῖθεν ἐρχόμενον κρῖναι ζῶντας καὶ νεκρούς. Πιστεύω εἰς τò πνεῦμα τò ἅγιον, ἁγίαν καθολικὴν ἐκκλησίαν, ἁγίων κοινωνίαν, ἄφεσιν ἁμαρτιῶν, σαρκὸς ἀνάστασιν, ζωὴν αἰώνιον. Αμήν. In the Church of England, there are currently two authorized forms of the creed: one found in the Book of Common Prayer (1662) and that of Common Worship (2000). And in Jesus Christ his only Son our Lord, Who was conceived by the Holy Ghost, Born of the Virgin Mary, Suffered under Pontius Pilate, Was crucified, dead, and buried, He descended into hell; The third day he rose again from the dead, He ascended into heaven, And sitteth on the right hand of God the Father Almighty; From thence he shall come to judge the quick and the dead. I believe in the Holy Ghost; The holy Catholick Church; The Communion of Saints; The Forgiveness of sins; The Resurrection of the body, And the life everlasting. Amen. The United Methodists commonly incorporate the Apostles' Creed into their worship services. The version that is most often used is located at #881 in the United Methodist Hymnal, one of their most popular hymnals with a heritage to John Wesley, founder of Methodism. The United Methodist Version is notable for omitting the line "he descended into hell," but is otherwise very similar to the Book of Common Prayer version. The 1989 Hymnal has both the traditional version and the ecumenical version, which includes "he descended to the dead." The United Methodist Hymnal also contains (at #882) what it terms the "Ecumenical Version" of this creed—a version which is identical to that found in the Episcopal Church's current Book of Common Prayer. This form of the Apostles' Creed can be found incorporated into the Eucharistic and Baptismal Liturgies in the Hymnal and in The United Methodist Book of Worship, and hence it is growing in popularity and use. The liturgical communities in western Christianity that derive their rituals from the Roman Missal, use the Apostles' Creed and interrogative forms of it in their rites of Baptism, which they consider to be the first sacrament of initiation into the Church. Such liturgical communities include Roman Catholics, Anglicans/Episcopalians, and Lutherans. Do you believe in Jesus Christ, his only Son, our Lord, who was born of the Virgin Mary, was crucified, died, and was buried, rose from the dead, and is now seated at the right hand of the Father? This is our faith. This is the faith of the Church. We are proud to profess it, in Christ Jesus our Lord. The Niceno-Constantinopolitan Creed is given first place in the text of the Roman Missal; but "the baptismal symbol of the Church of Rome, called the Apostles' Creed" may be used in its place, "especially in Lent and Eastertide" (Ordinary of the Mass, 19). The latter Creed is generally preferred also at Masses for children. The Episcopal Church uses the Apostles' Creed as a Baptismal Covenant for those who are to receive the Rite of Baptism. Regardless of age, candidates are to be sponsored by parents and/or godparents. Youths able to understand the significance of the Rite may go through the ritual speaking for themselves. Younger children and infants rely on their sponsors to act upon their behalf. 1. The celebrant calls for the candidates for Baptism to be presented. 2. The catechumen or sponsors state their request for Baptism. 3a. If the catechumen is of age, the celebrant will ask him or her if he or she desires Baptism, which the catechumen will state he or she says "I do." 3b. If the candidate relies on sponsors, the celebrant asks them if they will raise the child in "the Christian faith and life" (ECUSA BCP), and will raise the child through "prayers and witness to grow into the full stature of Christ" to which the parents will state to each, "I will, with God's help." 6. The Apostle's Creed is then recited in three parts symbolizing the Three Persons of the Trinity. ↑ For more information on the origin of the Apostles' Creed, see the detailed discussion in the Catholic Encyclopedia. Retrieved February 11, 2008. ↑ J. N. D. Kelly Early Christian Creeds (Longmans, Green & Co, 1972), 398-434. 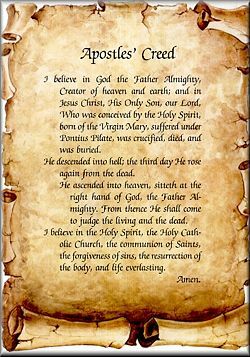 ↑ Apostles' Creed Retrieved February 11, 2008. ↑ ElCA Worship Retrieved February 11, 2008. Triglot Concordia. St. Louis: Concordia Publishing House, 1921. All links retrieved April 9, 2016. The Apostles' Creed Center for Reformed Theology and Apologetics. This page was last modified on 9 April 2016, at 16:19.